Looking for the best self propelled mower for your home? A self-propelled lawnmower is an easy-to-operate option for homeowners with a medium to large sized lawn who want something that is easier to push around. Here’s our list of the best self-propelled lawnmowers for purchase in 2013. We chose one cordless model for people who wanted something electric, and went with traditional gasoline powered self propelled models for all the rest. 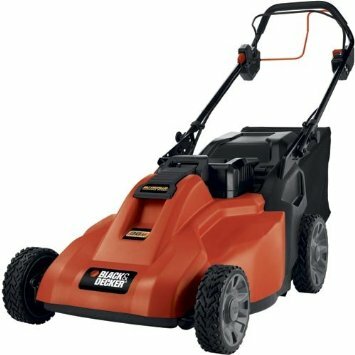 The only electric self-propelled mower to make this year’s list is the $450 SPCM1936 by Black and Decker. The manufacturer claims that this mower’s 36-volt battery will remain charged for 45 minutes, long enough to mow one-third of an acre. Consumers agree. In addition, the engine is powerful enough to handle some users’ overgrown grass. An LED light on the top of the battery indicates the remaining charge so you won’t find yourself in the middle of the yard when the battery runs out. It will take about 12 hours to fully recharge–either in or out of the mower–or you can swap in a second battery if you are willing to part with an extra $130. The SPCM1936 features a 19” deck with a one-touch cut height adjustment lever located on the rear wheel that is not restricted by incremental measurements. With its rear discharge and mulching capability, this smaller unit is a good option for mowing narrow areas and storing in tight spaces since the unit folds into an upright position. Assessments of the self-propelled feature vary and depend heavily on personal preference. Some reviewers claim the mower moves too fast even on the slowest setting, while others find the speed acceptable or even not particularly helpful. This electric-start gas mower is at the top of Honda’s premium residential line of self-propelled mowers and costs a steep $850. A 21” deck, 7 mowing heights ranging from ¾ to 4 inches, and an adjustable handle are some of the mower’s more typical attributes. But the most standout feature is the no-choke Honda GCV190 engine. Users on homedepot.com trust this engine’s performance over their Toros, Ariens, and Snap Ons. One reviewer tried to save money by buying a Craftsman mower with a Honda engine, but ended up purchasing the Honda HRX217HZA mower as a replacement. The hydrostatic transmission works in a similar manner to riding mowers by using a hydraulic pump and motor, a luxury nearly unmatched by other self-propelled lawnmower brands. Cruise control can be gradually adjusted via the handlebar to match variations in speed due to mowing conditions, but can be overwhelming while mowing down inclines since it reaches speeds of up to 4 mph. This mower features Honda’s own 4-in-1 Versamow rear discharge system that allows you to mulch, bag, discharge, and shred leaves in its 2.5 bushel capacity bag. Its dual blades make for an especially effective mulcher, accordingly to reviewers. While the polymer NeXite deck does not have a cleanout feature, it does come with a rust-free guarantee and increased air flow design to provide optimal cut conditions. The rest of the mower is covered by a 5-year residential warranty. The most expensive mower to make the 2013 list is the Toro TimeMaster 20200, which has an MSRP of $1150. It shares features with some other self-propelled mowers on this list: electric start, folding storage capability, dual blades for fine mulching, deck cleanout port, blade stop system, and factory guarantee (3 years full warranty). But here’s what makes it stand out. 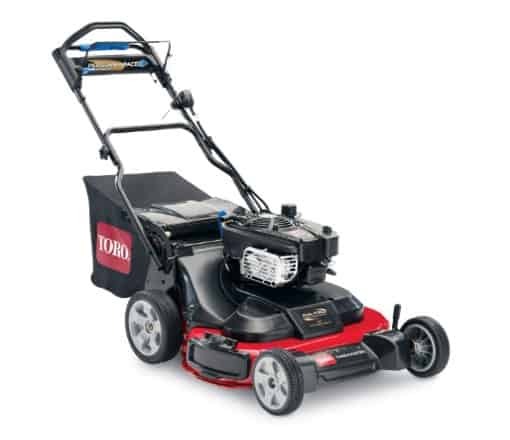 The Toro 20200 boasts a high-quality aluminum frame with a steel 30” deck, unlike the plastic housings found on the Black and Decker SPCM1936 and Honda HRX217HZA. This increases the unit’s weight, but the Toro’s self-pacing functionality includes the added assistance of a Traction-Assist Handle to help monitor speed and reduce effort. Due to the large deck size, users report their mow times have been cut in half, even better than the 40% time reduction that Toro advertises. 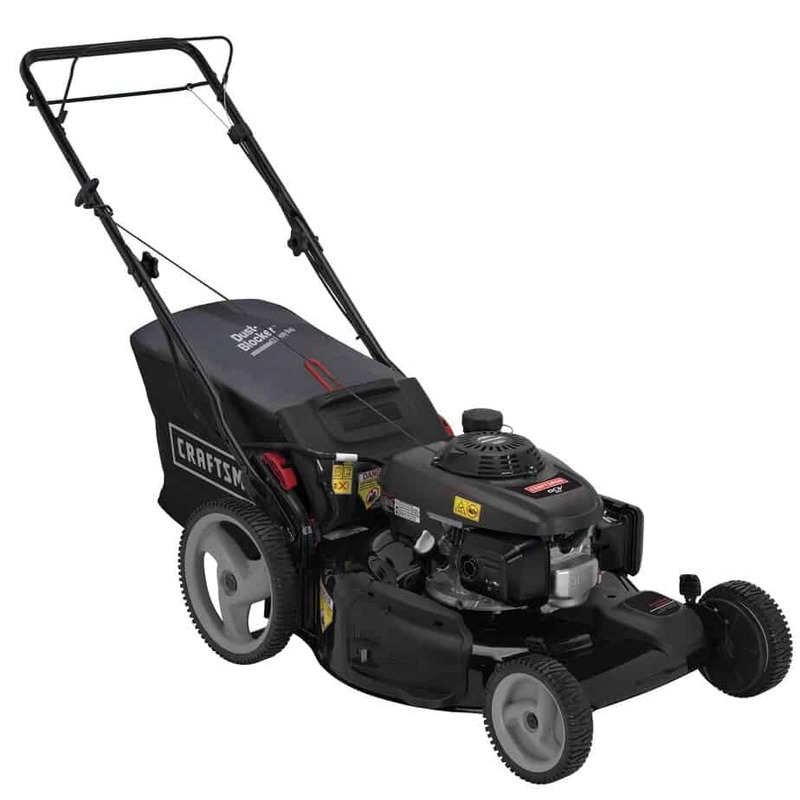 According to multiple reviews, the 20200’s Briggs & Stratton 190cc engine does not perform well in damp or wet grass. This recurrent complaint is a serious problem, considering the hefty price tag. We think a more powerful engine should be considered on future models to alleviate this issue. If you have a large lawn that isn’t quite large enough for a riding mower, consider the time-saving Toro TimeMaster 20200. Expect best performance and cut results if you mow more often than weekly and live in a dry climate region. Following the most expensive unit on the list is the cheapest: you can pick up the Craftsman 37060 for $280. For this price, we feel the popular 37060 deserves flexibility when evaluating its available features and functions. However, users can’t find much to complain about other than its too-small bag size, unpadded metal handle, and excessive dust (despite its Dust-Blocker Grass Bag). The 37060 sports a 22” steel deck that is capable of rear and side discharge mulching and bagging. High 12” rear steel-rimmed tires help with traction control while rear-wheel bearings help with maneuvering. 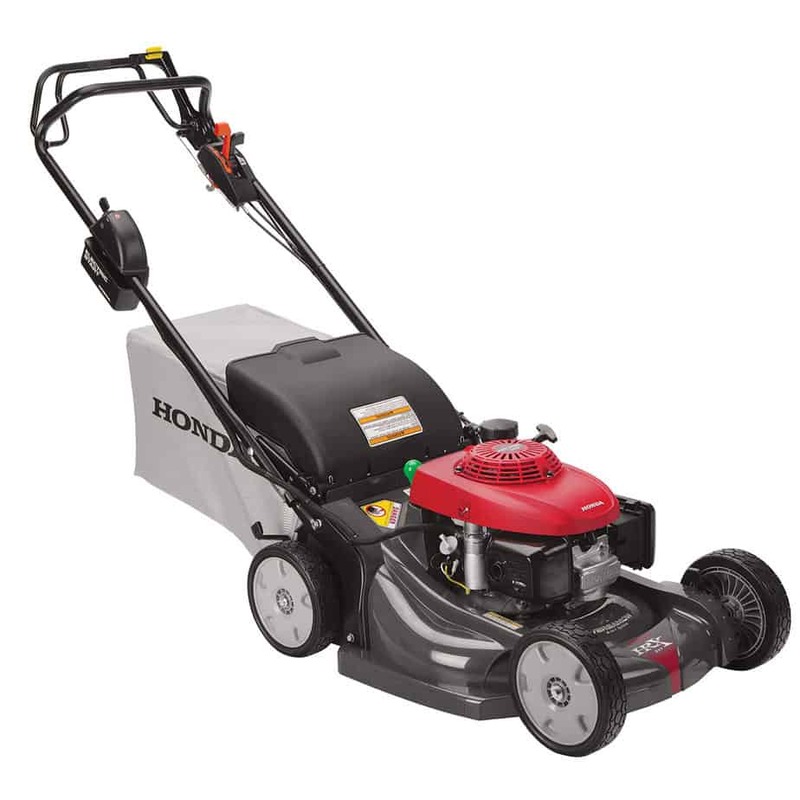 The 160cc engine is made by Honda, and we can’t help but wonder if this might be the model one reviewer bought instead of a more expensive Honda brand mower, hoping to get the same great Honda engine reliability (see above: Honda HRX217HZA). In fact, we discovered that many sears.com reviewers purchased this model because of its powerful pull-start engine. Some did experience occasional engine malfunctions, but this is true of all models we assessed, and Craftsman does include a 2-year warranty. Quiet and lightweight, this is a fuel-saving affordable choice for small lawns and budget-conscious mowers who need basic features and expect a clean cut with over 9 cutting positions at a single cut speed. Another self-propelled gas mower option for $300 or less is the Troy-Bilt 230. 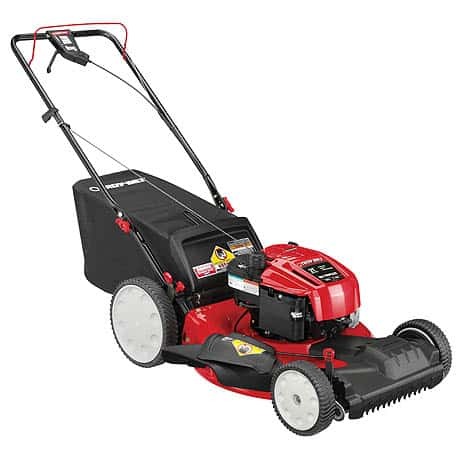 We feel the Troy-Bilt is in the same class of mower as the price-comparable Craftsman 37060. Like the Craftsman, users found the bag to be way too small. And while both the Troy-Bilt and Craftsman feature high adjustable rear wheels intended to help maneuverability (11” and 12”, respectively), some users found the Troy-Bilt’s front wheel drive resulted in awkward turns that ripped out patches of grass. Those owners ultimately replaced the rear tires with smaller wheels. Unlike the Craftsman, the 230’s smaller 21” deck features the Troy-Bilt TriAction Cutting System. The Troy-Bilt offers fewer number of deck height adjustments (6) using a dual lever mechanism but offers a greater cut height range. Its 190cc ReadyStart Briggs & Stratton engine outpowers the Craftsman’s 160cc Honda engine and comes with the promise that if the engine doesn’t start on the first or second pull, it will be fixed for free. Finally, we particularly like the squeeze grip variable speed control function versus the Craftsman’s single speed. If in the market for a lower priced, lightweight self-propelled gas mower, a careful feature comparison of the popular Craftsman and Troy-Bilt mowers will provide a good starting point. Did we leave your favorite self propelled mower off the list? Do you own one of these models and love it or hate it? Leave a comment and let us know! I bought this mower an immediately started having issues. After 2 attempts and having to cut my grass 2 times each time I finally took it in for service (grass was left uncut literally right under the mower). The dealer installed a baffle and new high lift blades. I cut a few more times and the first time I used mower height adjustment the adjustment cracked. The mower also bogs down with cutting any wet or slightly high grass. The mower also does not turn over on the first start with the electric start. Toro’s supervisor Liz said continuing to bring the product back in for service (Which is very inconvenient due to its size and weight) is an acceptable practice. She said it was a big assumption that it will continue to break. Keep in mind a 4 month old machine with now 4 items already needing to be replaced. Supervisor Liz even said even with a catastrophic failure (engine etc) they will not refund your money or replace the machine they will only repair it. For this kind of Money get a different machine. With this experience this was my first Toro and definitely my last. They do not stand behind their products. I find it hard to believe that the Ariens Model 911194 is not at the top of your list! In 2013 I replaced my 20-year old Ariens Model 911SW (damn thing wore out the main engine bearing after only 20 years) with the then current Model 91184. I moved the front swivel wheels from the old mower to the new one (except for the worn-out engine, the old one was still fully functional). The 2013 version has a larger engine than the original, but is otherwise almost identical. The current Ariens Model 911194 appears virtually identical to my 3 year old model which I love. To top it all off, the Ariens is made in Brillion, Wisconsin, USA. When I had to replace my old mower I phoned Ariens and spoke to a manufacturing employee who was wonderful source of guidance. I can’t imagine a better mower/manufacturer combination.